Howard Post, Outside the Shipping Pens , Oil on Canvas, 36 " x 44"
One of today’s top impressionist artists, Howard Post depicts the contemporary West in a modern, simplified style. His universal paintings of landscapes, people and animals are based on real experiences and photos he has taken wile traveling across the country. 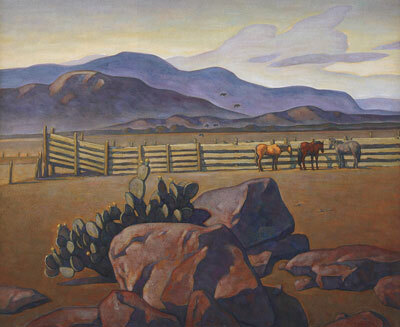 Throughout July, Medicine Man Gallery in Santa Fe, New Mexico, will feature Post’s latest paintings in which he spotlights the West and Southwest, including a few mountain scenes. Collectors will notice subtle, brighter hues than in past works. In every creation, he takes a leap of faith and allows the painting to dictate the direction it wants to take. As a result, some of the new scenes are more predominantly landscape and smaller in size, such as 11 by 14 inches rather than his typical 36-by-44-inch format. Howard Post, Western River, Oil on Canvas, 18" x 36"
“What’s always important to me is the landscape balances or reacts to human involvement: there’s a touch of humanity in them,” says Post. Post’s paintings have a consistent feel that he has maintained throughout his 30-plus-year career. Like Monet, he paints the same subject multiple times in different light and seasons, always trying to keep the canvases fresh by not copying himself. In the 1980s, Post depicted close-ups of figures, often eliminating the landscape. Over time he has progressed, offering a wider, more dominant viewpoint of the landscape with the figure or animal secondary. Ideal examples of this can be seen in the new paintings titled Last of the Haycrop, Outside the Shipping Pens and Western River, Post experiments with a long horizontal format, another subconscious shift that he’s noticing is happening more often. “It’s fun to push the dimensions. It adds a little element of challenge for the artist and makes it more exciting,” he says. 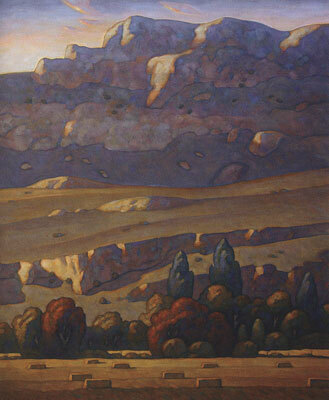 Howard Post, Last of the Haycrop, Oil on Canvas, 52" x 42"